Put the finishing touch on all of your desserts with a burst of orange color from these fun, decorative sprinkles! They'll add sugary sweetness and unique texture to any dish. The uses of sprinkles are endless, making them a versatile ingredient to have on hand. Sprinkle these tiny, thin, rod-shaped confections into your signature cookie batter, atop a flavorful ice cream sundae, or use them to garnish frosted cupcakes. Whichever way they're served, they're sure to be a staple for your ice cream parlor, bakery, or diner. And with 10 lb. of sprinkles, you'll be in good supply! Turn every occasion into a celebration with delicious baked pastries and confections covered in sprinkles. Fun and decorative, these orange-colored sprinkles enhance the overall presentation of any dessert, tempting your customers back for more. 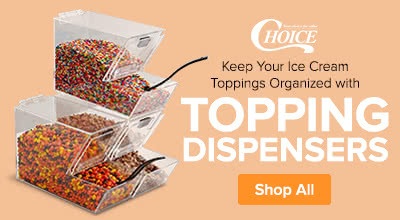 They can also easily be mixed in with icings, toppings, mix-ins, and ingredients. Simply pour your sprinkles into a serving dish, and you're ready to start concocting ice cream sundaes and other dessert creations! Overall User Rating: Orange Sprinkles - 10 lb. This is your standard sprinkle. The color is orange and it does have a nice orange color. It adds really good color to what ever you add it to. When you use a lot of sprinkles you want a good quality product. Great colir, flavor and size. These are it. Plus they do not crumb or break. I have pretty much every color of sprinkles that exists. They obviously all taste the same but it is nice to have a different color than your traditional rainbow sprinkles all the time. They all sell really well in my shops and they do not leave that awful aftertaste that you sometimes get from other brands. These are delicious! I love that this website has so many different color options for sprinkles. It really makes everything interesting. Anyways, these are delicious and we are so happy we bought them. A nice orange colored sprinkle that tastes great and are the perfect consistency. They are great for making our cupcakes in a jar and add nice presentation. A great fall themed sprinkle. I use solid colored sprinkles mixed with themed sprinkles during different seasons and holidays. I used the orange for Halloween and Thanksgiving. Webrestaurant is has the best price and selection. We use a variety of toppings BUT the sprinkles are the most popular and the colors we use are vibrant these KEEP their color and are a GREAT price as well ! Even the cheapie sprinkles at my local big box store are four times the price per ounce these are, and those are tasteless. These have a lightly sweet flavor that isn't too waxy. I bought them 3 years ago, I keep them in a sealed jar in my pantry and they still taste great. We use them in applesauce, on caramel apples, cupcakes, and of course ice cream. I love that when kids come over I don't have to feel stingy with the toppings- they love them and so do I! A nice bulk box of orange sprinkles that are perfect size for decorating sugar cookies. They are great for using during Halloween and are priced wonderfully. A great, quality sprinkles that is perfect for decorating your cakes or cookies. The orange is perfect for the fall and Halloween. The sprinkles are a great addition to any bakery. Loved these bright orange sprinkles! They were a good size and not too small when we used them for special orders. There is great variety in the colors offered, so I would recommend using any of these as they are a good quality product. The vibrant orange color is a wonderful addition to any treat. These are great for everyday use and many specific occasions. Sprinkles just add that extra something. I used 10 lb. of orange sprinkles to make my Halloween pretzels and Oreos really pop this season! Bright orange and delicious tasting! I would order again! This is the first time purchasing these sprinkles and they are perfect for topping our caramel apples and other confections! The price is the best we have found from any supplier, even when you include the shipping fees. These sprinkles were great! The color was spot on and they had a great taste. They were a hot for the sundae bar. Packaged in a heavy duty plastic bag. these are Great quality sprinkles. We use them for all kinds of things at the bakery. Was glad to see them available in a larger quantity. great sprinkles. we buy these in every colors. they do fade if you have them in a clear container and they get any sun at all. Love the bright color of these sprinkles. They are very shiny and are whole shaped thick sprinkles. Not broken or long skinny sprinkles. Because of their thickness, they have a great flavor! These sprinkles look and taste good, and the orange is perfect for autumn baked good decorating and Halloween cupcakes and treats in particular! Very reasonably priced. 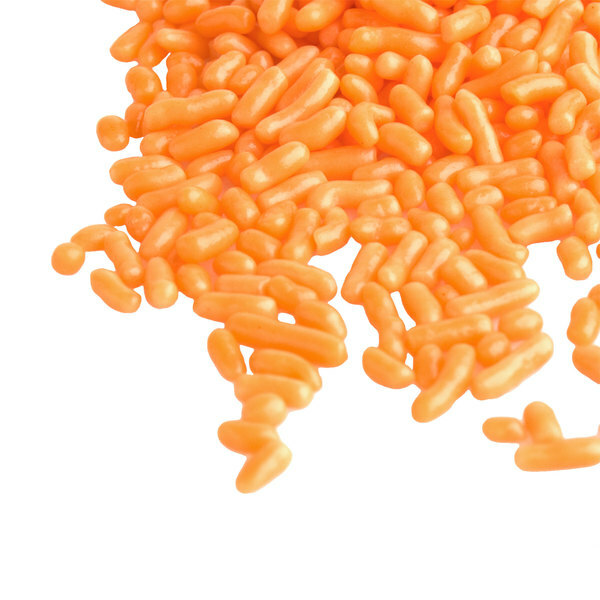 These are your classic sprinkles but all in orange! A great item to have for Halloween or orange themed events! I love pairing them with black sprinkles to decorate cakes and cookies every year at Halloween. I just used them for a family members birthday too!! Good flavor! LOVE these sprinkles. I like this site because it lets me order more than one color and I choose my color of sprinkles per the season/holidays! Will definitely order again from this site and this product. These orange sprinkles are really wonderful for halloween cakes, or thanksgiving cakes. I love the light orange color they are because it is perfect for autumn. I really enjoy these vibrantly bright orange cupcakes! They are just perfect for Halloween, which is when they are most popular as well, the price is great too. These orange sprinkles are great for halloween cupcakes and sheet cakes! They taste great and the 10 lb box will last for many baking projects to come! This color is so absolutely perfect for any halloween treat. The orange also works for anything that is orange or pumpkin flavored. The price is also right. these are really good sprinkles. they hold on the icing very well. they look get at halloween when you use chocolate cupcakes and fudge icing.